I love grilling season. Sure, we could be super dedicated and try to grill year round, but it's tough to keep the grill hot enough in the cold, tough if it's windy, and it gets dark early in winter. Excuses, excuses, but we grill a lot from May-September. One of our favorite grilled meals is grilled chicken thighs with Apricot-Mustard Glaze. I forget the source of this recipe and I didn't note it on my index card. I'm thinking it was from a Cook's Illustrated Magazine? 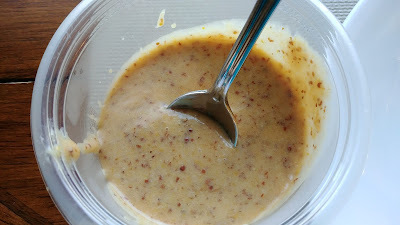 I'm pretty sure I've written about this glaze before, but I cannot find a link on my recipe page, so I decided to write about it again. It's a super easy sauce, half set aside for brushing on the chicken and half for dipping. Combine all ingredients in blender (we use our Magic Bullet Blender). 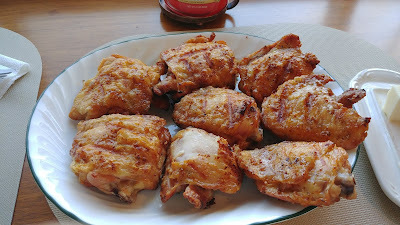 Divide in half, half to brush on chicken near end of grilling and half served on the side for dipping.